Not an easy film to summarize in a few pithy sentences. Powerful, multi-layered story of - it's not quite a love affair, is it? -both a kind of love and hurt set against the unforgivable sins of Nazi war crimes and the Holocaust. 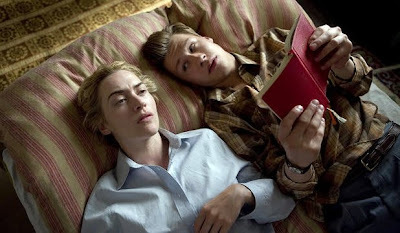 Very moved by several aspects of the film: the affair in the first act, the war crimes trial Kate Winslet's character endures, the moral debates during the trial, the reveal of the secret Winslet was so ashamed of she was willing to spend life in prison for her role in the Holocaust to hide it, and the sequence where older Michael sent her tapes of books he read to her. No quarrels with Winslet's Best Actress Oscar win. If there's a weak link, it's Ralph Fiennes; the flaw not being in his performance but in the choice of casting him. Fiennes will never go hungry playing thin-lipped and stiff-assed, but doesn't quite line up with David Kross' performance as young Michael Berg. The lesson The Reader imparts might be best summarized by the stripper who once offered the following sage advice to Michael Scott in The Office: "Secret secrets are no fun. Secret secrets hurt someone."